We have a verified medical case for whom we are fundraising. The kid is the son of a poor Veda Vadiyar (Hindu Priest/Pujari). 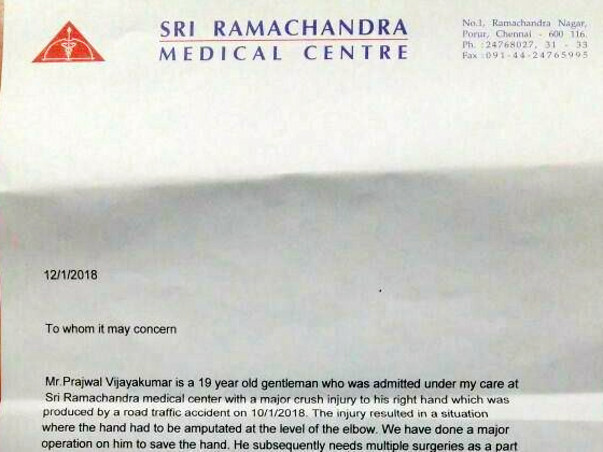 Someone, who has zero benefits from the Government.19 year old student Prajwal Vijaykumar Pursuing Aueronatical Engineering, had met with a terrible accident on 10/01/2018 and is in a critical condition in Porur Ramachandra Hospital where he is undergoing a treatment.The doctor has decided to go for a plastic surgery on his right hand. 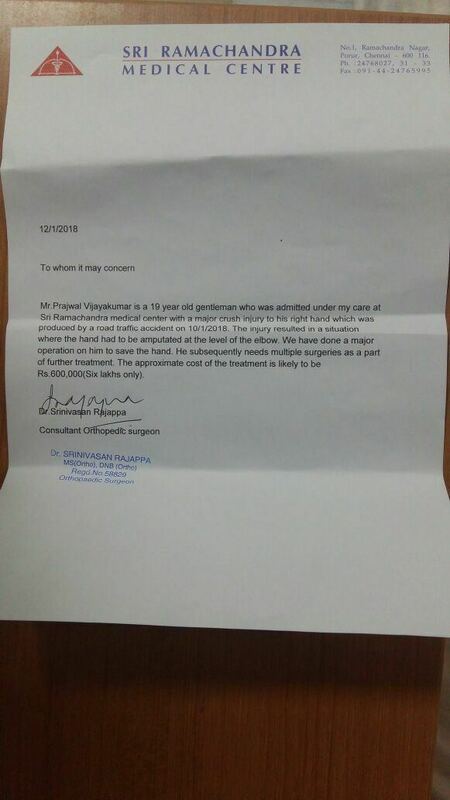 His dad, a Veda Vadhyar had undergone heart surgery last November. The family's financial condition is very poor and they're helpless at the moment. The surgery requires a fund of Rs 600,000 (Rs Six lakhs). Helpline account details of hospital are attached below. Let us come forward to save a Hindu life, who is supposedly forward according to caste, but financial very backward. Even a measly sum of Rs 500 from 1000 of us would uplift a family. 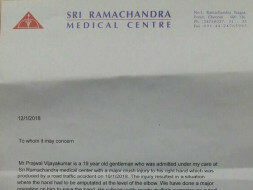 Thanks for all of your prayers and support, Prajwal's surgery has been successfully done. 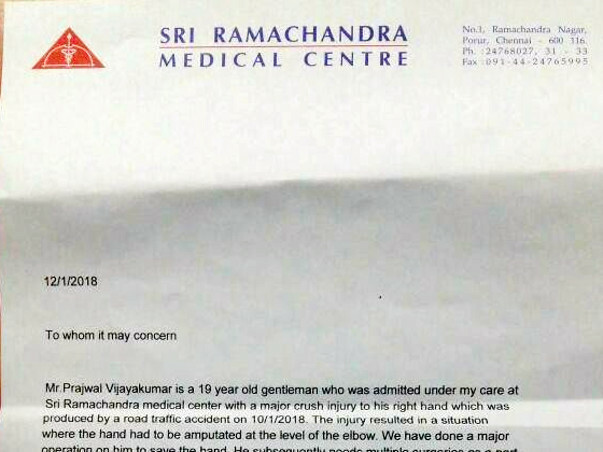 A nerve transplant surgery had been conducted on his arm to save it from getting amputated. He was kept under observation for more than 10 days, wherein all the impurities which had collected in his arm (dust particles) were drained out. A second surgery was done and he's now fit and has been discharged from the hospital. Doctors have revived the arm and now he's doing fine. Physiotherapy sessions are given at the hospital every alternate day. Will get Prajwal to record a video and give an update to all the good souls who had contributed to this noble cause.